Sub: TSSA- Updation of Online application of Teachers Information and Cadre Strength in www.childinfo.tg.nic.in website - Instructions - Issued - Reg. The attention of all the DEOs & EOPOs of TSSA is informed that the online data entry of teachers information and cadre strength is available in www.childinfo.tg.nic.in website. Now the same is need to be updated in view of the reorganization of districts & mandals, and transfers, promotions of teachers, change in pay scales and salary etc. 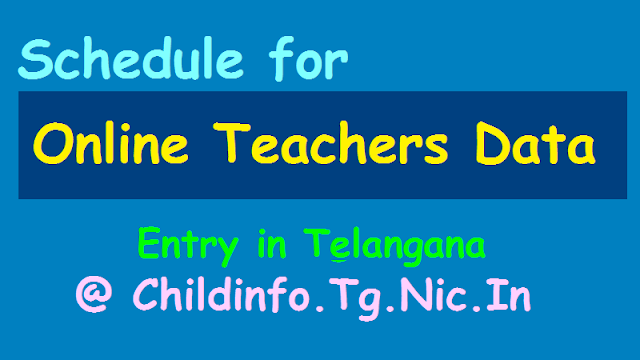 Subject: Online data entry of Teacher Information and cadre strength particulars in Telangana State Schedule Communicated - Regarding. All the District Educational Officers and Project Officers of TSSA in the state are aware that Online data entry of Teacher Information and cadre strength particulars has been taken up during April / May 2015 and nearing completion in all districts of Telangana State. In this connection the following time schedule is communicated. 1. The last date for uploading of data on Teacher Information and cadre strength particulars is now extended to ..
Last date for updation of Teachers particulars online : ..